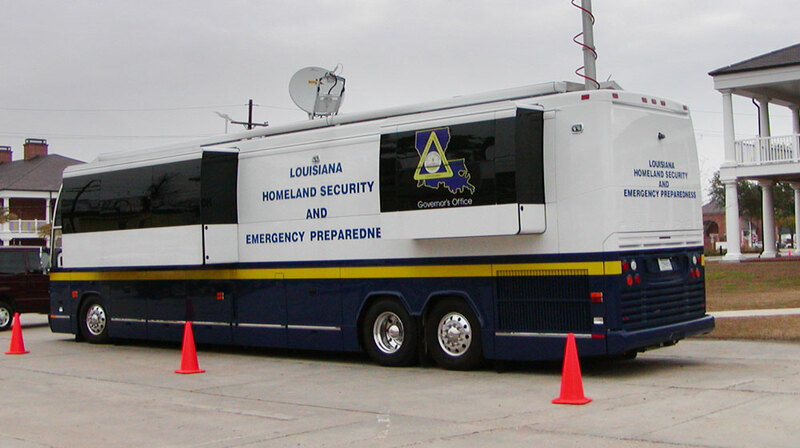 GOHSEP, formally the Louisiana Department of Homeland Security and Emergency Preparedness, was created by the Civil Act of 1950. Since 1990, the agency has managed 16 federal disaster declarations and has coordinated several hundred state disaster declarations authorized under the governor’s signature. The agency’s mission is “to lead and support Louisiana and its citizens in the preparation for, response to and recovery from all emergencies and disasters. According to Jay Lockwood, Tactical Systems Branch Manager for GOHSEP, the need for a mobile stand-alone communications system for use by government authorities and emergency responders arose during Hurricane Katrina. Lockwood explained that based upon that experience, GOHSEP started to look for an alternative means to provide rapid communications to support the state of emergency response effort in the event of future outages. Lockwood and his team acquired several trailer-mounted satellite units that can be deployed across the state in the event that parts of the state lose telephone and Internet connectivity. Inside each satellite trailer is an EnGenius DuraFon industrial cordless phone system and a wireless access point/bridge. “When we deploy these units, it takes about 20 minutes and we can provide Internet and four telephone lines,” explained Lockwood. Lockwood explained that each of the parishes in Louisiana has an emergency operations center (EOC) and in the event that a tornado or hurricane incapacitates the infrastructure, one of these satellite trailers can be brought in to provide Internet connectivity and telephone service even if the facility has no electricity. Each trailer is equipped with eight EnGenius DuraFon handsets that provide access to four outside telephone lines through the satellite link. The long-range wireless capability of the phones allows the base station to remain outside on the communications trailer while the handsets are located inside the EOC. For “hardened” EOCs that are shielded against the transmission of wireless signals, Lockwood’s team simply takes a hardwired remote base station into the EOC to provide telephone service. According to Lockwood, the satellite trailers equipped with EnGenius phones and wireless networking equipment give the EOCs and all the parishes a degree of confidence. In the event that they lose communications, they know that GOHSEP can provide phones and Internet access to establish and maintain command and control. Learn more about the DuraFon Series from EnGenius.